This is a particularly powerful and tense clip from this Saturday’s fifth episode of Outlander, “Rent.” The clip is called “Payment for Rent” and features Claire Beauchamp (Caitriona Balfe) having a confrontation with Dougal MacKenzie (Graham McTavish). 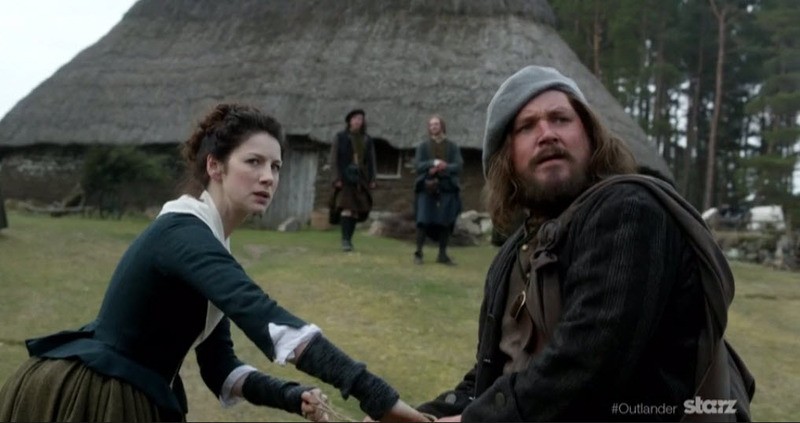 You can see Claire’s stubbornness as she tries to wrangle a goat away from Rupert MacKenzie (Grant O’Rourke). Of course, Angus Mhor (Stephen Walters) had lost track of the Sassenach again. Jamie Fraser (Sam Heughan) and Ned Gowan (Bill Paterson) can be seen in the clip also. “Rent” airs this Saturday, September 6, 2014 on Starz at 9 ET/8 CT. This entry was posted in Bill Paterson, Caitriona Balfe, Graham McTavish, Grant O'Rourke, Sam Heughan, Stephen Walters, TV Show Clips and tagged Angus Mhor, Bill Paterson, Caitriona Balfe, Claire Beauchamp, Dougal MacKenzie, Episode Clips, Graham McTavish, Grant O'Rourke, Jamie Fraser, Ned Gowan, Rent, Rupert MacKenzie, Sam Heughan, Stephen Walters by Sarah Ksiazek. Bookmark the permalink.